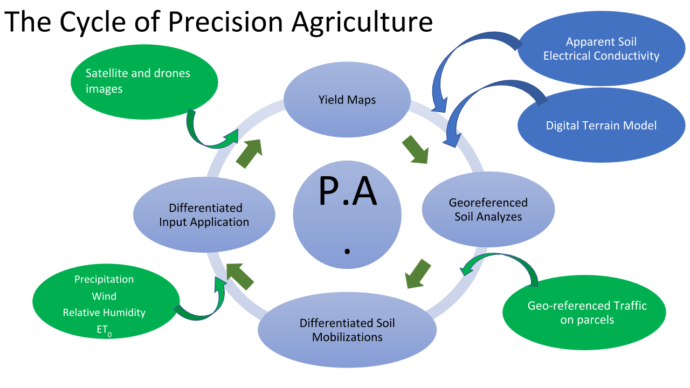 The main objective of precision agriculture is to develop a process to support the farmer’s decision-making, in order to achieve maximum productivity with the lowest cost of production factors, thus reducing emissions and impacts on the environment. When the farmer has to make a decision, he can use his historical knowledge (from his own memory or from the collective memory of his region) or rely on the support of Precision Agriculture. Quinta da Cholda is building a decision-making plan, based on information collected and treated over the last few years, which we called “The Cycle of Precision Agriculture”. This information is now analyzed with the support of information management software. We use Qgis for all the georeferenced data and Microsoft Power BI for the statistical analysis and treatment of all the data we had in Excel from the past 8 years. Our challenge now is to create a method of scaling the system to address the exponential amount of data and information that is being produced, so that it can be used in the process of decision making. We have now a cycle of collection and treatment of data which will lead to the prescription of variable applications (VRT) for the applications of fertilizers and phytos, herbicide application and even mobilization decisions. Historic production yields and climate data, is also being added to the cycle, thus becoming more robust over the years. We are now testing the introduction of climate data online, as well as the management of NDVI images from satellites and drones, which will help us predict much more accurately the development of the physiological cycle of plants and plan the applications of phytos and irrigation. We are this way adapting to climate change and the large variability between years, creating models to respond in a timely manner to such variability between the agricultural years.